13’2 Pony, been there done that got the t-shirt. This Pony is an absolute rock, has done ponyclub, cross country, showjumping, perfect allrounder that really cares for the rider. 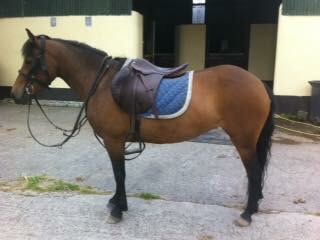 Fudge is a 7year old bay gelding. Easy and kind to do in the stable, clip, load etc. Rides out alone and in company. Pony stabled in Ireland, transport can be arranged.